Have you ever tried weird flavor combinations? Like mixing Black Pepper and Lemon for making a delicious, crumbly, sweet cookie? If you haven’t, you should! We have a lemon tree in our backyard which produces huge lemons year-round. My sister-in-law gave us a wonderful book called Luscious Lemon Desserts by Lori Longbotham, and I’ve done several of her recipes throughout the years. 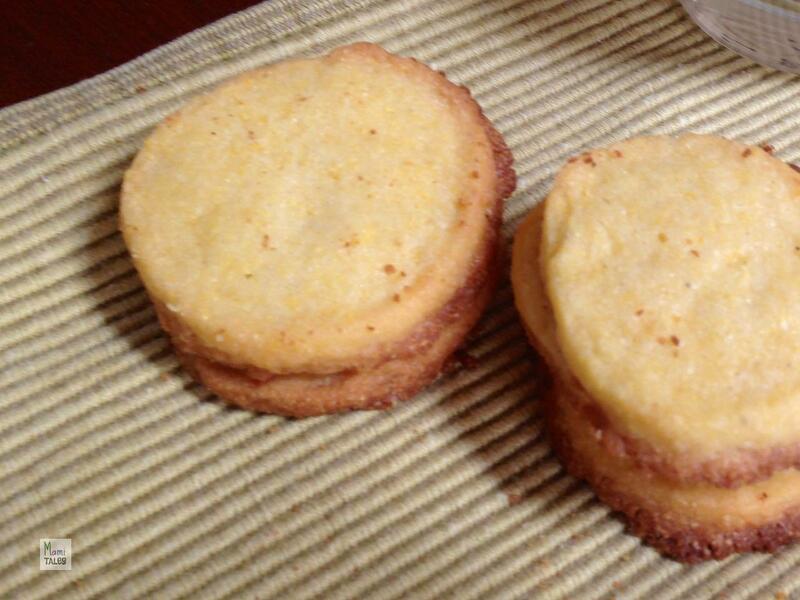 One of my favorites are these Lemon Black Pepper Cornmeal Cookies. If you also have access to unlimited amounts of lemons, I sincerely recommend buying this book and trying the fabulous recipes in it. What I love about the recipe, apart from the great lemony taste, is the fact that you can prepare the dough and then stick it in the fridge. Once you’re ready for making the cookies, all you need to do is get the dough log out, cut it up and bake it. And presto! You have fresh baked cookies in 20 minutes. The Black pepper in these cookies just gives them a little fun sensation in the mouth, while the buttery sweetness of the lemon makes them dissolve in your tongue. Whisk the flour, cornmeal, black pepper, and salt together in a medium bowl. Beat the butter, sugar, and zest in the medium bowl of an electric mixer, beginning on low speed and increasing to medium--high speed, until light and fluffy. Add the egg yolks and beat to combine wells. Reduce the speed to low, add the flour mixture, and beat on low speed just until blended; the dough will be crumbly. Press the dough together with your hands and divide it in half. Place each half on a sheet of wax paper and form each piece into a 10 by 1 1/4 inch log. Chill the logs, wrapped in wax paper, until firm. At least 25 minutes before baking, position a rack in the middle of the oven and preheat the oven to 400ºF. Butter 2 large non-stick baking sheets, or use a silpat mat. Cut each log into 1/4 inch-thick rounds and arrange the rounds 2 inches apart on the baking sheets. Bake, 1 sheet at a time, for 10 minutes, or until the edges of the cookies are golden brown. Transfer the cookies to a wire rack and let cool. Do you have any recipe which combines weird ingredients like this? If so, drop a link in comments and I’d love to try it out! Tagged Baking and Cooking, Desserts. « Learning about Story in Kids Movie Class!